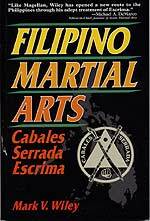 This is a definitive work on the Cabales Serrada style of Escrima, Escrima being one of three major Filipino martial arts. The book was written at the request of the originator of this style of the art and one of the Philippine’s greatest masters by Wiley, a disciple of the master and one of the best known authorities on the Philippine arts. The art is famous for its stick and knife techniques as well as for its many joint locks, disarms and body locks as part of the unarmed techniques within the system – moves that will remind many of jujutsu or aikido techniques.